Let’s see, exactly HOW can I become a ‘Sanctuary City’, again? This is something the previous administration was doing. Hopefully, with this new administration, the spigot (and with it, tacit approval) has been shut off! 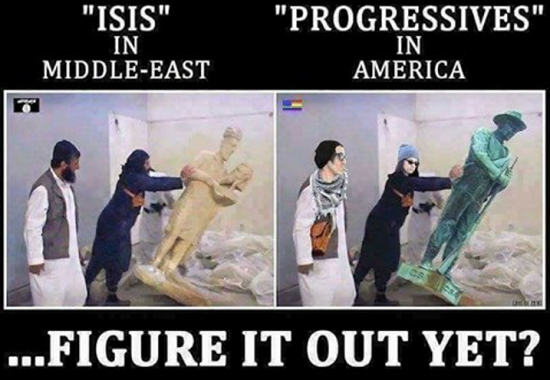 ISIS And US Progressives – What’s The Difference? There was supposed to be a general strike of female folk to show solidarity against President Trump’s record of abuse (a locker room joke told eleven years ago), and his capitalist/anti-socialist policies. Tamara informed us that IF women are to be participating in commerce, it should ONLY be with women and minorities! She surmises Blacks, Asians and other folk must be honorary women for the day! What I take from the general strike folks is women and minorities are the oppressed. Oppressed by THE MAN! More specifically, the WHITE MAN. Except, of course, those who voted for him. And, these strikers failed to consider collateral damage. If kids go to school, and no female teachers are present, where will they go? The inmates are in charge of the asylum. California has created a travel ban of its own, which prohibits its own public university students from traveling to “anti-LGBT” states. The law that went into effect Jan. 1 prohibits state-funded travel to states that are not LGBT-friendly, the Los Angeles Times reported Tuesday. The law prevents students of the University of California and California State University from traveling to four states outlined by California attorney general Xavier Becerra, including Kansas, Mississippi, North Carolina and Tennessee. Not LGBT friendly? As defined by the California AG? I’m not certain what that means, exactly. Rejected ‘gender non-specific’ bathroom legislation? Didn’t give extra rights to persons who are gender confused? How is banning a student from travel (through the use of State funds) going to teach them anything about freedom? (It does teach them about the abuse of State Power.) And, how many students does this affect, exactly? Sports teams? Band members? Debate clubs? I think the California Attorney General is tilting at windmills, in the name of political correctness. Abraham Lincoln was a devotee of the Alexander Hamilton/Henry Clay “American System” of public debt, tariff protectionism, government subsidies and a national bank. To finance his war in 1861, Lincoln turned to an income tax, and then succumbed to printing money. Nowhere in the United States Constitution is the federal government authorized to make paper money legal tender. By 1865, the public debt was $2.6 billion, and the direct/indirect cost of Lincoln’s war would reach $8 billion by 1900. “Contrary to official capitalist wisdom, debt does not create economic growth. This idea is a swindle. Interest to the very rich . . . does not produce anything. It does not multiply creatively into new enterprises and jobs; it merely diverts ever-greater proportions of earning that might be fruitfully invested. The proof is all around us. How could the vast unpayable federal debt, which absorbs much of the government’s income just for the interest bondholders, foreign and domestic, possibly be an economic stimulus? How can the immense and near universal burden of personal mortgage and credit card debt possibly indicate a healthy economy and commonwealth? The matter is simple, obvious to anybody except a politician, a captive economist, or a media flack, and it ought to be conveyed to the people at every opportunity. Debt is killing us. Every wise man in recorded history has affirmed that debt is not a good thing. Debt can destroy a family, a government, a society. Weighed down by government debt, the people would have to labor ever harder to pay the debt-holders, leaving them “no time to think, no means of calling the managers to account.” Jefferson avowed as a core principle that “the earth belongs in usufruct to the living,” but the living had no right to consume the earnings of posterity. Antebellum statesmen like John Taylor of Caroline and John C. Calhoun and economists like William Gouge and Condy Rageut made the same case. After the War Between the States, so did William Graham Sumner, Thomas E. Watson and countless other public men and thinkers. Republicans (and their predecessors) have always been the party of bankers and bondholders, service to the rich being for them a natural and essential function of the federal government. Opposition to the federal debt was long a plank in the Democratic platform, but Democrats today are just as guilty as the Republicans in regard to the issue. Lip service to the virtue of “low public debt” continued until Franklin Roosevelt discovered Keynes and declared that debt is no problem “because we owe it to ourselves” – “ourselves” being a conveniently vague and collective being. where the Good Lord split ya! WASHINGTON – Sen. Barbara Boxer of California bid farewell to Congress on Wednesday after 33 years as a liberal champion, choking up as she read a letter from jazz great Sonny Rollins thanking her for “making life beautiful” for the people she’s represented. Thirty three years is way too long for anyone, progressive/conservative/green/libertarian to be a sitting United States Senator! So very glad this one is gone. If memory serves, she demanded a military officer address her as Senator, instead of Ma’am. Technically, we’re supposed to, in accord with Rules of Etiquette. But an officer operates under different rules! I, for one, will not. Ever. It’s important to understand why liberals are so angry and so scared. They are angry because they believe they have a moral right to command us, apparently bestowed by Gaia or #Science or having gone to Yale, and we are irredeemably deplorable for not submitting to their benevolent dictatorship. They are scared because they fear we will wage the same kind of campaign of petty (and not so petty) oppression, intimidation, and bullying that they intended to wage upon us. Mr. President-Elect – Let’s NOT play their game and show them your side can be gracious and benevolent winners. Perhaps, they will learn something?